What do the recipe card templates look like? Learn what the recipe card templates that come with Tasty Recipes look like and how to activate one on your website. The Tasty Recipes plugin comes with a variety of styling options. When the plugin is first activated, recipes have minimal styling that automatically picks up the styles of your theme and makes the recipes blend into the rest of your site. If you're looking for a more styled layout, Tasty Recipes offers a few options. To select a recipe card style, navigate to Settings ➡ Tasty Recipes and select a style from the options. All recipe cards have an optional Instagram footer. If you include your Instagram handle and hashtag information, the Instagram footer will show up below the recipe card. If you are switching from the uploaded Bold or Fresh recipe cards to the built-in ones, please read our documentation here. The images below show an example of what the recipe cards will look like. Because Tasty Recipes picks up styles from your theme to make the recipes look "at home" on your website, the cards may appear slightly different on your site. 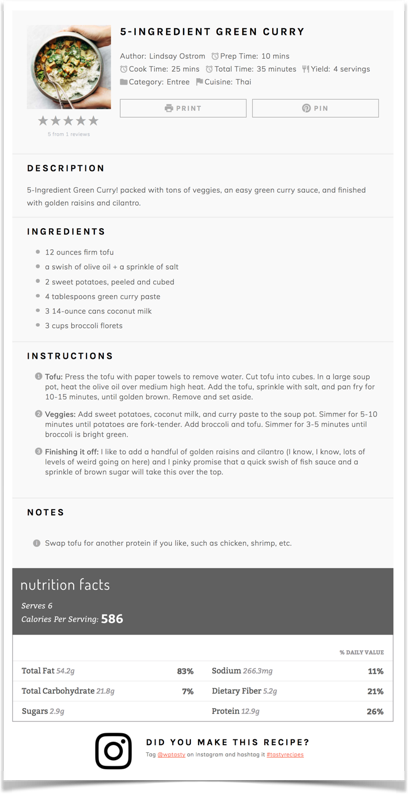 The Elegant recipe card has a light-grey background (can be set to match your theme), modified recipe details, capitalized headers, and smaller fonts for the notes and nutrition information. The Simple recipe card has a transparent background (i.e. it'll match the background of your site), a thin grey border, modified recipe details, all lowercase headers, and smaller fonts for the notes and nutrition. The Modern Compact Recipe Card features a side-by-side format for the ingredients and instructions when viewed on desktop and tablet screens. 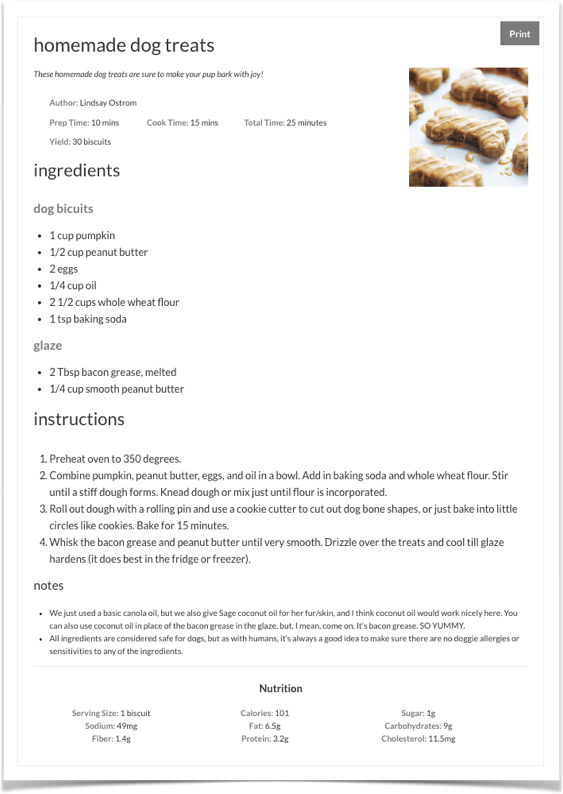 On mobile (or any screens smaller than 500px wide), the recipe displays with the ingredients on top and instructions below. The Bold Recipe Card emulates the style found on the Pinch of Yum website. A centered top image, bold lines, and strong content areas accentuate the recipe design. An optional footer area has your Instagram information, and Nutrifox embeds beautifully. The Fresh Recipe Card was designed exclusively to match the Foodie Pro theme, though it'll feel right at home on many other themes just as well. Soft grey colors create a simple, modern feel. Custom bullets, numbers, and an optional Instagram footer make this recipe card really stand out. These templates can be customized to match your blog with CSS. Or, if you're looking for something totally different, Tasty Recipes also allows you to use fully custom styles for your recipes. If you are interested in creating your own styles for Tasty Recipes, we give some examples of how to do that in this help doc: How can I create custom CSS for Tasty Recipes?